The USS BOSTON (CAG-1), a Baltimore class cruiser, was commissioned on 30 JUN 1943. USS BOSTON served her country for 26 years, 10 months and 5 days, until decommissioned on 5 MAY 1970. The sixth Boston (CA-69) was launched 26 August 1942 by Bethlehem Steel Co. Fore River Mass. ; sponsored by Mrs. M. J. Tobin wife of the Mayor of Boston; and commissioned 30 June 1943 Captain J. H. Carson in command. Boston reported to the Pacific Fleet arriving at Pearl Harbor 6 December 1943. She joined TF 58 in January and took part in the raids on the Marshall Islands in support of the invasions of Kwajalein Majuro and Eniwetok (31 January-28 February 1944); Palaus and Western Carolines (30 March-1 April); Hollandia and Western New Guinea (21-24 April); Truk including Satawan Island bombardment (29 April-1 May); invasion of Saipan (11-24 June); 1st Bonins raid (15-16 June); Battle of the Philippine Sea (19-20 June); 2nd Bonins raid (24-26 June); 3rd Bonins raid (3-4 July) invasion of Guam (12 July-15 August); Palau-Yap-Ulithi raid (25-27 July); Morotai landings (15 September); seizure of the southern Palaus (6 September-14 October); and Philippine Islands raids (9-24 September). She served with TF 38 during the Okinawa raid (10 October); northern Luzon and Formosa raid (11-14 October); Luzon raids (15 and 24-26 October 13-14 and 19-20 November and 14-16 December); Battle for Leyte Gulf (24 26 October); Formosa raids (3-4 9 15 and 21 January 1945); Luzon raids (6-7 January); China coast raids (12 and 16 January); Nansei Shoto raid (22 January); Honshu and Nansei Shoto raids (15-16 February and 1 March) in which she bombarded Japan itself. Boston then returned to the United States for overhaul arriving at Long Beach Calif. 25 March 1945. Returning to the Western Pacific via Pearl Harbor and Eniwetok she joined TF 38 for the raids on the Japanese home islands (20 July-15 August) including the bombardment of Kamaishi Honshu (9 August). Following the Japanese surrender Boston remained in the Far East on occupation duty until 28 February 1946. She then returned to the United States and was placed out of commission in reserve at Puget Sound Naval Shipyard 12 March 1946. Boston was reclassified CAG-1 4 January 1952. In February 1952 she was towed from Bremerton Wash. to Philadelphia for conversion to a guided missile heavy cruiser by New York Shipbuilding Corp. Camden N. J. During conversion her after-8" turret was replaced with anti-aircraft missile launchers and she was otherwise modernized. Boston was recommissioned 1 November 1955 and operated along the east coast and in the Caribbean conducting missile evaluations and participating in fleet exercises until departing for the Mediterranean 23 November 1956. She returned in May 1957. 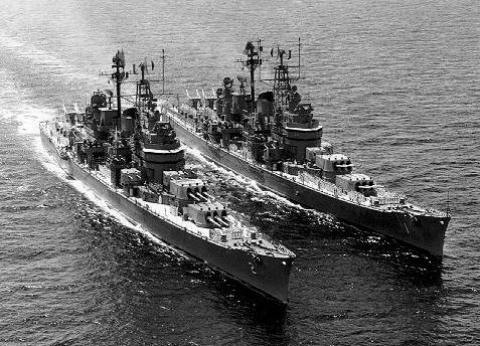 Boston received ten battle stars for her World War II service.